Who doesn't love Bruce Willis? Sure, the guy has starred in a slew of bombs these past few years, from Cop Out to Surrogates. And yes, the actor has been known to make a fool out of himself while sporting a toupee on the talk show circuit. 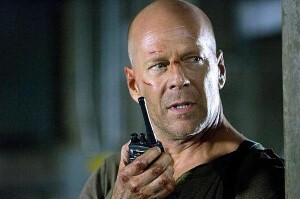 Still, Willis will always and forever be known as John McClane, star of Die Hard, predecessor to Jack Bauer and an all-round badass. If he doesn't get the words "Yippee-ki-yay Motherf*#!er" inscribed on his tombstone, it'll be a crime. So it's really difficult to hate his new film, Red, where he plays a down-and-out former CIA agent. Living on pension checks and spending his days flirting over the phone with Sarah (Mary Louise Parker), a receptionist at the office that manages his retirement plan, the guy realizes that his life is at a standstill. Cue the Academy Award nominees from stage left. After a team of assassins ransack Frank's home and try to put a cap in his head, he decides to assemble his old buddies in order to investigate. This includes the wacky Marvin Boggs (John Malkovich) and the sickly Joe Matheson (Moragan Freeman). Also entering into the mix is Dame Helen Mirren, one of the foxiest senior citizens this side of the western hemisphere (if you never thought you would see a lady hold her weight with a machine gun, think again). The fact she most likely subscribes to AARP Magazine and usually shows off silver hair doesn't matter – she looks good in a tight sweater and she knows it. Red isn't the best CIA film to be released this decade, or perhaps even this year. Still, it's a flick that has action, hot babes young and old, and, yes, Bruce Willis. Young teens who can handle the violence will love him as much as you. And if all else fails, rent Die Hard on the way home and call it a night. Child-friendly? Red is the story of a down-and-out former CIA agent who collects retirement checks and spends his days chatting on the phone with a babe. When a group of people attempt to kill him, he gets together his old gang to figure out what's going on. The film contains scenes involving violence and strong language. Recommended for ages 13 and up.